JFK Tapes » How Many Nuclear Missiles Are Enough? Secretary of Defense Robert McNamara holding a press conference during the Cuban Missile Crisis. In this military budget discussion in the White House on December 5, 1962, Secretary of Defense Robert McNamara offers his recommendation for how many nuclear missiles are enough for the United States to have. 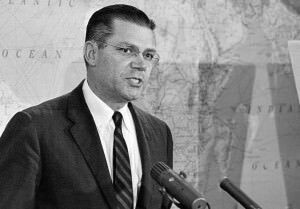 Later in life, McNamara would become a leading advocate of nuclear disarmament, but as Secretary of Defense he oversaw a large buildup of nuclear forces. With so much uncertainty about what the Soviets have and what will serve as a deterrent, he said, “we ought to buy twice what any reasonable person would say is required for strategic forces” because the consequences of being caught short were dire. McNamara It’s both—it’s principally to deter. And it’s also to give ourselves the confidence that we have that deterrent power, give ourselves and our allies the confidence that we have it. Tape 65.2, Presidential Recordings Collection, President’s Office Office, John F. Kennedy Library. Transcript by David Coleman.